Langtang Village in November 2014 and 2015. The earthquake in April 2015 triggered avalanches and landslides, covering large parts of Langtang Village with a thick layer of debris, rock, and ice. Adorned with mani walls — stones carved with prayers placed along the road - prayer flags, grazing yaks and surrounding white peaks, for more than five years Langtang valley has been a favourite passage for Dorothea Stumm en route to her research ground on Yala Glacier. Stumm, a senior glaciologist with the Water and Air group of the International Centre for Integrated Mountain Development (ICIMOD), has travelled to the valley more than six times, each time leading a group of students and professionals from partner organisations to conduct trainings on glacier mass balance monitoring for the Cryosphere Monitoring Programme. Hiking the path through Langtang Valley with a group of glaciology students, participants from partner organisations and resource persons for field based glacier mass balance training last November, Stumm saw for the first time since the earthquake in April 2015 the devastation to the once thriving valley community. In the upper inhabited part of the valley, majestic Langtang Lirung towers over the villages. The mountain has a history of ice breaking off and creating powder avalanches where streams of broken ice flow down the mountain, accompanied by falling cloud of dispersed ice and snow particles and an air blast. In powder avalanches, the air blast creates more destruction than large snow masses. The long mani walls between some of the villages were built for protection, warning of landslides and avalanches. The earthquake in April 2015 released powder avalanches of enormous sizes on several sides of Langtang Lirung, devastating upper Langtang. A huge avalanche hit Langtang Village, blowing away houses and snapping trees for three kilometres down the valley. The blast destroyed the settlements Gumba, Chamki, Tsarding and Thyangshyup. The tremendous force of the avalanche and earthquake broke free a large deposit of debris, rock and ice about 1000 m above Langtang Village, which landed on top of the village. Kyangjing, the highest village in the valley, was hit by an enormous avalanche, where the air-snow blast badly damaged houses and blew some rooftops to the other side of the valley. The settlements Singdum and Mundu were affected by similar blasts and debris flows. The older part of Langtang Village in November 2014 and 2015, which suffered substantial damage from the air blast of the avalanche triggered by the earthquake. In the background, the landslide of rock, debris, and ice is visible. Stumm was shocked by the magnitude of damage she saw. ‘Many buildings are badly damaged, and in some areas where the air-snow blast carried away entire buildings, vegetation and bridges, and where an ice-debris layer covers Langtang Village, the landscape is beyond recognition. One can’t help but feel overwhelmed knowing what used to be there’, Stumm said. However, she noted the efforts of the local population in keeping the valley accessible by rebuilding tracks and bridges where necessary. ‘The route is very well chosen and we can see that they know the terrain very well’ Stumm said. ‘In some villages, guesthouses reopened for trekkers’. Langtang Valley was a popular tourist destination for trekking, biking and climbing opportunities. The valley is also home to Yala Glacier, one of the most studied glaciers in Nepal. Located about 5160 m to 5750 m above sea level, Yala Glacier is a clean glacier, which is relatively easy to access for conducting field based trainings on mass balance measurement. Unlike other regions across the globe, studying glaciers in the Himalayan region is comparatively difficult because the glaciers are located at high altitudes and in remote locations. Every year in autumn, the Cryosphere Monitoring Programme organises an expedition to Yala Glacier as part of capacity building and to maintain the long-term glacier monitoring programme. Mass balance measurements are carried out biannually with the autumn expedition focused on training students and professionals from partner organisations. Training participants from the Department of Hydrology and Meteorology (Nepal) use an ice auger to drill a hole into the glacier to install bamboo stakes for glacier mass balance measurements. A second year glaciology student from Kathmandu student labels the 6 m long bamboo stake. In the background is Ganga La (pass, 5122 m) and to the right is Naya Kanga (5846 m), a popular trekking peak. Prior to a field expedition, team members go through theoretical training, learn the background of glacier monitoring, health, as well as safety and basic mountaineering skills. In the field, Stumm and the accompanying team of experts demonstrate field based glacier mass balance measurements using bamboo stakes, snow pits as well as differential GPS. Lessons include hands on training on the use of equipment such as a steam-driven ice drill, ice corer and snow density kit to measure mass balance. 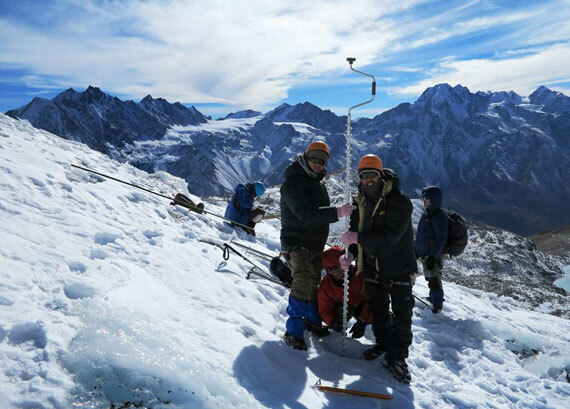 Students learn about the weather station, the role glaciers played in the formation of the landscape, the powder avalanches triggered by the earthquake, and practice basic mountaineering skills on the glacier. This November, the team consisted of students from Kathmandu University, staff from the Department of Hydrology and Meteorology, Nepal, and from Bhutan’s Department of Hydro Met Services, an internationally certified mountain guide and ICIMOD staff. The group was supported by a trekking agency team, including mountain guides that helped with the measurements and numerous porters that transported the equipment. 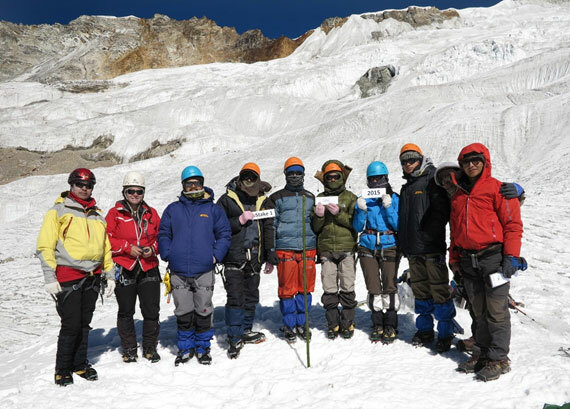 Part of the expedition team on Yala Glacier with a newly installed bamboo stake for glacier mass balance measurements. However, conducting glacier studies is resource intensive as research involves hiking to the glaciers over rugged terrain with heavy equipment and supplies with the risk of altitude sickness and challenging weather. Last November’s expedition to Yala Glacier lasted 16 days including extra nights for acclimatisation. Acclimatisation involves a slow ascent to allow hikers to adapt to higher altitudes, and is crucial to work safely in high altitudes. Stumm emphasised the importance of the Cryosphere Monitoring Programme and the long-term mass balance monitoring programme maintained in the region, enhancing knowledge about cryosphere. ICIMOD plays an important role to train and build capacity to further developed skills in the region, ensuring exposure to new knowledge and maintaining quality science research. The expedition team gathers at camp and enjoys a magical evening. 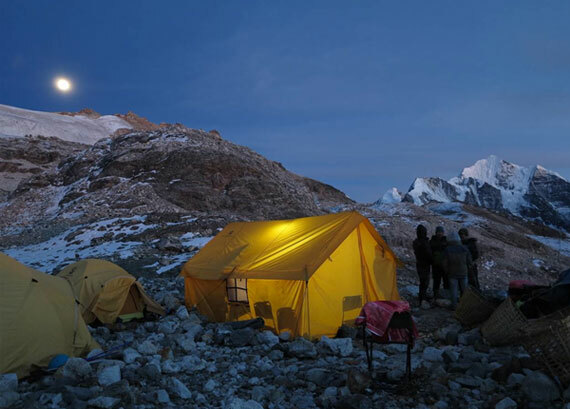 With the rising moon, gleaming Yala Glacier and Ganchenpo peak (6387 m) in the background, the trekking agency team prepares dinner.